It is hard to get your head around the fact that already three months or a quarter of this year has already gone, harder still is the realisation in that only in eight months time and then if Laminar Research keeps to its normal release timetable then X-Plane11 will be already halfway through its development run. So soon Laminar Research will looking to start X-Plane12. So it is frankly shocking how quickly the time goes by. In my eight years in X-Plane and seven years doing reviews I have never had a year start like 2018. Chaotic is one word that comes to mind, but more in just the simulator is really, really busy. Aircraft and Scenery are coming at a phenomenal rate in upgrades and releases and not to mention all the plugin and effect downloads you can get your hands on. X-Plane lately is exploding and to be honest it is hard to keep up with it all sometimes. So you do need to focus on what is worth catching and using as well as flying and to a point that is what this site is all about. But with all the huge amount of changes coming through it is also bringing in other elements that need users need to be aware of. Most older based X-Plane users are quite wise and switched on to these elements, but the newer cross-platform (i.e. Flight Sim/P3D) and new simulator users are a bit more detached on the way that X-Plane goes about it's business. They are used to a no boundaries or even the credulous use of simulation, that aspect has positive areas, but also negative areas of the way of flying on-line. With the success and the huge in-flow of new users to X-Plane these elements are also bringing in the good and the bad as well. 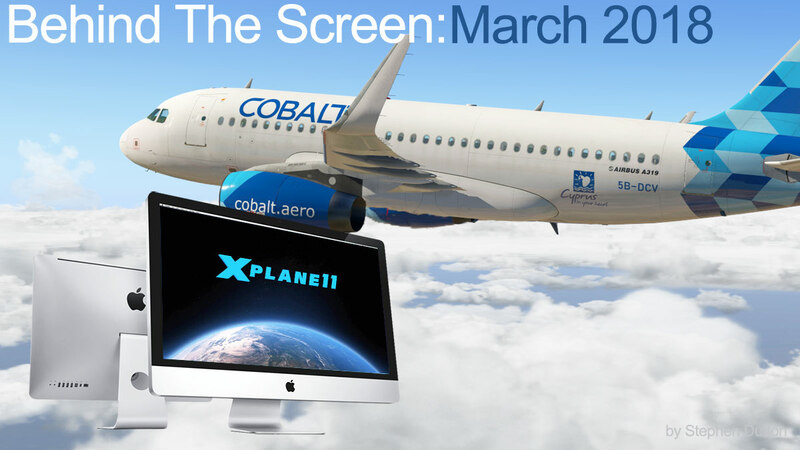 In no period previously has X-Plane had more announcements and new or old if you even count in the introduction of both Orbix and FlyTampa into our sphere of downloadable product, and it is certainly exciting to welcome of such well known names. But we need to be wary as well as many businesses and individuals are now eyeing the gold marked cash cow that is X-Plane. I will note that X-Plane is still in reality a growing platform, and in product it has a long way to go to compete with the of the FS/P3D market, but one point is that X-Plane product is far deeper and more varied and certainly has better quality than other platforms than many users actually take for granted. That said the very top level of the say PMDG, Majestic or Captain Sim is still a "Study Grade" niche area that remains to be filled with more choice. The worrying aspect is the devious types now eyeing the cash. It is easy to set up a checkout store and start selling product, in fact it is far too easy. The sudden demise or closure of the let’s sim store is a reminder that not everyone out there plays the game well, in going down they took a lot of money with them, but worse the users are now out of the update loop that doesn't allow them to update their purchases in the future. To a point there was always bad noises around the site from the start with gullible developers (whom should know better) and starry eyed users going along with it all. The problem comes from a fact of life, is that everyone or anyone can start these stores, but can't actually run them. In X-Plane we have been a bit mollycoddled by having the X-Plane.OrgStore. Efficiently run and very reliable with brilliant service, and no I am not saying that because they give this X-PlaneReviews site a lot of access for reviewing purposes, but that is a well known fact in the X-Plane universe. But overall you know if it is available on the .OrgStore site then it is backed up by service and your money is safe and more importantly the developers trust it as well. And trust is the word here, and you are going to have work out if any new store on the game is worth your investment. I have a few sayings and they always hold true... one... "if it is too cheap then there is either something wrong with it or you are being done" and two... "at the end of the day if you want quality, you have to pay for quality". A twist on that is not to be extorted either, in that knowing "what you are buying is worth the value" You can easily pay too much for an average product. That is what X-PlaneReviews is mostly about in dissecting the best from the rest. Not only will the expanding of the X-Plane universe bring dodgy punters, but also more dodgy trouble-makers. "Fake-News" is a modern day mantra, but the dangerous ones who only want to bring attention to themselves, again it is very easy to set up a site to throw venom and crazy thoughts, but these actions can have repercussions that can hurt. Many a so called "Breaking News" sites are also opening up and they are mostly in the "cut and Paste" new variety, I welcome these sites, but these "cut and pasters" don't do the hard yards either in cross-referencing their news sources and can mostly broadcast false information more than correct information. The effects this year already are obvious in the so called "News" sites the amount of false information that is broadcast is not good, they "cut and paste" but don't think either as they want "eyes" on their sites and the too feel good with all that attention, they don't care about the damage they can do to a developers reputation or to the X-Plane Simulator itself, it is all about them in the end and "Just about them and getting that attention". ditto their reviews, poorly constructed but also missing crucial facts of the aircraft or scenery they are reviewing, I'm not against anyone doing reviews and in fact I will encourage them to have a point of view, but in not simply delivering the correct information or the correct features of a product is simply a "no, no" from my point of view, as you the users deserve the right information and correct facts about that product. Already we have had one developers reputation severely damaged by this nonsense, and that is not good. 90% of reviewing a product is mostly research or cross-referencing to get your facts right, you deserve the correct information above everything else. There will always be trouble and mischief makers or just the plain idiots, but uninformed publishers can do real damage, and if anything is dominating this year already it is that aspect of poor checking of facts, so do yourself a favor and if you find a site that the facts don't add or stand up them give them a miss, if they can't be smart then you can. The introduction of Orbix and FlyTampa is a big moment for X-Plane and will go a long way to fill out one of the biggest blank areas of the simulator. We need seriously good scenery and too a point it has been flowing quite nicely over the last few years. JustSim scenery deserves your support, I admit it is basic scenery, but they do deliver and also use all of the X-Plane11 features and at a low cost price, support them as they are delivering the goods as with their excellent LCLK Laranca which is already on my high rotation for flights. ShortFinal (mister_x) is another brilliant scenery developer as his KABQ-Albuquerque and it is simply the very best. But Orbix and FlyTampa are still a very unknown quantity in X-Plane. Aerosoft hasn't exactly helped with their successful FS/P3D crossovers working correctly in the X-Plane environment. Some of Aerosoft's scenery is excellent, and I use them to a very high level, but a lot of scenery are badly transferred and some of the old FS/P3D scenery that is frankly crap for the money you are paying and uses non of the X-Plane features to even help out their case along... so in reality Aerosoft's casebook is very contradictory of poor consistency. I know now they will say that "X-Plane is unprofitable and so the scenery has to be produced to a cost factor" but that is defeating the point? Sell us crap and then wonder why we are not buying it? The really annoying thing is that to bring these sceneries up to a good standard costs them almost nothing but using the right developers to do the job, and worse is that Aerosoft are not new to X-Plane, but have been in the simulator for years now and yet nothing at all has changed in their approach, and my point is "Don't blame us for not delivering the expected profits" until you get more consistency and quality in your own products right and treat X-Plane with the same quality you expect from our market as from other markets. And that brings us to Orbix and FlyTampa. Both can have huge market share in X-Plane, but the point is they have to deliver quality X-Plane scenery as well, if a small development house like JustSim can, then why not these juggernauts. But the same question is still valid. "are you going to deliver cheap crossover titles from FS/P3D" or deliver quality X-Plane featured scenery? That answer is in the future. The main effect of both Orbix and FlyTampa is the sort of scenery they deliver. They are not constrained to the US/Europe axis, although a lot of their product is still in those regions. But Orbix has a lot of exciting "Oceanaia and Australasia" scenery that will certainly expand out the use of X-Plane as does FlyTampa with their excellent OMDB-Dubai and YSSY-Sydney. FlyTampa are exciting as well because they just don't deliver the scenery, but the complete surrounding areas as well with the excellent Dubai city as a hallmark of great scenery and the most (I won't say bootlegged) but transferred scenery from FS to X-Plane in the simulator's history. Their FlyTampa-Hong Kong Kai-Tak also comes with a full Hong Kong city vista as well and that is what makes these guys special, yes both Orbix and FlyTampa can make a huge difference to X-Plane, so yes we must support them, but like with Aerosoft above it is a two way deal, how this will play out will be interesting but it is overall exciting and the start of a new era for X-Plane..
A few monthly notes on my ongoing battle of the Airbuses, with the A320U (Ultimate) and the ToLiSS319. At this point the ToLiSS319 is ahead on points, I fly it far more often and enjoy the sheer dynamics of its systems. It was very hard not to hit the forums a few weeks before the release to scream "This is bloody brilliant" because the ToLiSS319 is absolutely brilliant to fly as you now know. I noted that the ToLiSS319 will be the most popular aircraft in X-Plane by the end of the year and that title is fully deserved and as the developer is bringing out updates and bug fixes at a right click and the bus will easily be so very good by the years end. But I do hope some time is also devoted to the FF A350 with the same (ToLiSS) MCDU set up installed, and that would be a real top off a brilliant year for Airbus flying in X-Plane. So where does that leave the FlightFactor A320U? Very high up there "Thank you very much" and as the nautical miles now slip by it gets better by the moment, as it is a brilliant simulation. But one in area that puts the A319 the notch above it is in the area of system failures, as I find myself constantly stuck flying with failures or even being grounded by issues (Flap jack fail?). Yes I like the realism of failures but not to the point that they can't be rectified or switched off, small areas of failure yes, but grounding me after twenty minutes of setting up the aircraft is only going to send me sparse and only a restart and a re-input is going to get me flying again, that is a "no, no" and I will simply go and fly something else (mostly the A319). That area needs attention to be a little more versatile which is shame because I really do like this aircraft. A full review on the FlightFactor A320U is still coming in X-PlaneReviews, but I want to get it totally right before putting letters to the screen, this is a deep aircraft and it deserves a deeper understanding to deliver the correct review. The news of Andrey Sheybak and his family that were in the building of the "Winter Cherry" mall in the Siberian city of Kemerovo was shocking as is the fact that it was on how it is so easy to be in the wrong place at the wrong time. The fire took 64 lives and it could have easily have been Audrey and his family, to say that X-Plane "missed a bullet" is not to be dwelled upon, but the loss of xEnviro to the simulator would have been a great loss. The plugin development is at this point on hold at v1.08 until further information is forth coming. Overall March 2018 was another chaotic month, but with some really great releases. The Matterhorn Park 3D was a spiritual journey back to one of the most important places I have ever visited, and this scenery really delivered in that look and feel of Zermatt, really well done and the genius of the developers. The Alabeo Ovation XP11 was a really big surprise on how good it really was, a really lovely aircraft that went very quickly into my rotation for constant use hangar, loved it... a lot. And the Aerobask DA-62 was as expected another brilliant and fully rounded release from now one of the very best developers in X-Plane, there is always a proud moment when our own developers deliver a world class product, well Aerobask does... well done guys. See you all next month..